Mike Wade of Fielding Hills Winery recalls a formative wine experience at Chieftain Restaurant in Wenatchee, Washington. An avid beer drinker at the time, Wade decided one night to try a glass of “house Burgundy” along with his prime rib. As fate would have it, there were no French inspectors in town otherwise this story might never have been written. Instead, Wade became hooked on wine. After traveling to Napa Valley in the mid-nineties followed by trips to the Yakima and Walla Walla valleys in 1997 and 1998, Wade became increasingly interested in growing grapes and making wine. As part owner of Columbia Fruit Packers, an apple and cherry packing business, he saw similarities between growing apples, cherries, and grapes. As he looked more into growing grapes and making wine he kept asking himself the same question - “Could I do this?” After seeing a seeing a small-scale wine operation in Walla Walla, he decided that the answer was yes. To get started, Wade spent time in 1997 and 1998 making wine in carboys like many a budding winemaker does. He says, “I did learn from that experience, although the results were not drinkable.” He was, however, not dissuaded. In the spring of 1998 Wade planted a twenty-four acre vineyard in Mattawa, Washington. The site was not far from Chateau Ste. Michelle’s Indian Wells Vineyard, so Wade had reason to believe grapes would grow well there. He also planted grapes near his home in East Wenatchee. He quickly abandoned this project however when the results did not meet the quality he was looking for. The site in Mattawa, however, would succeed beyond all expectations. In 1999 Wade’s learning curve greatly accelerated when he met Gordy Venneri of Walla Walla Vintners and Charlie Hoppes, then winemaker at Three Rivers Winery. Wade peppered each with questions about winemaking. He started writing his own step-by-step guide to document the process. Wade says he spent, “many nights at the winery writing, reading and analyzing what was happening in front of my very eyes and then calling Charlie or Gordon and asking questions.” By 2000, he was ready. The first crop at Wade’s Riverbend Vineyard, named after the bend in the Columbia River near Priest Rapids Dam, was in 2000. Fielding Hills Winery was bonded that same year. In naming the winery, Wade says, “My grandfather's name was Isham Fielding Wade, and as you look at the hills surrounding the winery, the name seemed to fit.” The winery is located in East Wenatchee in a converted orchard shop. Wade describes the building as “Not pretty but very functional.” Wade made four hundred cases of wine in 2000. The winery has since grown to about 1,400 cases annually. In addition to running the winery, Wade and his wife Karen keep more than busy raising a family and working in the apple and cherry business. At this writing, the Wades were in the middle of a fifty-five day cherry harvest. While some might find an almost continual harvest cycle daunting, for the Wades, it is simply a part of life. Describing her role in the winery Karen Wade says, “As in most small businesses, I am everything that needs to be done.” Of her husband, she says, “He has a deep love for the soil of Eastern Washington. He sees apples and cherries growing, picked, packaged and shipped. 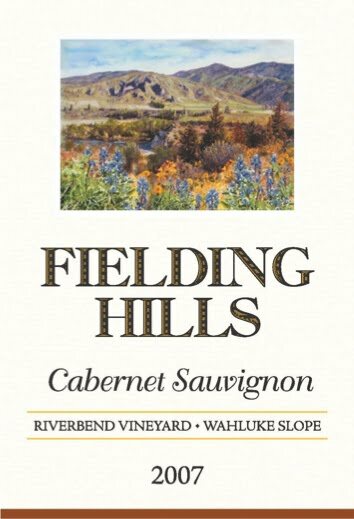 He is very excited to see his grapes actually in a glass being consumed.” With Fielding Hills now entering its tenth year, there is much to be excited about. Rating: * (Excellent) An aromatic nose with herbal notes, mint, cranberries, and high-toned cherries accented by sweet oak spices. On the palate, a big dollop of red fruit along with herbal notes. A luscious, fruit-filled wine. 93% Merlot, 5% Syrah, and 2% Cabernet Sauvignon. Riverbend Vineyard, Wahluke Slope. Aged 19 months in a combination of American and French oak barrels (72% new). 15.1% alcohol. 172 cases produced. Rating: * (Excellent) A lightly aromatic nose with pepper, cherry, chocolate, and sweet oak spices. The palate is plush with cherry fruit along with soft tannins and pleasing acidity. A beautifully balanced wine. 88% Cabernet Franc, 6% Syrah, 4% Merlot, and 2% Cabernet Sauvignon. Riverbend Vineyard, Wahluke Slope. Aged 19 months in a combination of American and French oak barrels (72% new). 15.5% alcohol. 134 cases produced. Rating: * (Excellent) Nose is marked by bright cherry aromas, mint, licorice, and chocolate accented by sweet oak spices. Packed tight with beautifully rich fruit on the palate. 88% Cabernet Sauvignon, 8% Syrah, 3% Merlot, and 1% Cabernet Franc. Riverbend Vineyard, Wahluke Slope. Aged 19 months in a combination of American and French oak barrels (72% new). 15.6% alcohol. 189 cases produced. Rating: + (Good) Fairly light in color. A lively nose with lots of red and black fruit, licorice, mocha, wheat, and spice. Dry and tart on the palate with heaping amounts of fruit. 43% Syrah, 30 Merlot, 18% Cabernet Sauvignon, and 9% Cabernet Franc. Riverbend Vineyard, Wahluke Slope. Aged 19 months in a combination of American and French oak barrels (72% new). 15.3% alcohol. 197 cases produced. Rating: + (Good) Aromas of coconut shavings come to the fore on the nose along with abundant red fruit. Palate is filled with juicy red fruit flavors accented by silky oak. Alcohol gets a little intense at times. 92% Syrah, 4% Merlot, and 4% Cabernet Sauvignon. Riverbend Vineyard, Wahluke Slope. Aged 19 months in a combination of American and French oak barrels (72% new). 15.3% alcohol. 184 cases produced. Pictures courtesy of Fielding Hills Winery. Thanks Coop! Good to see you at WBC10 however briefly. Sean, you know how I feel about Fielding Hills. One of the top notch Merlot's in the state. Karen and Mike are great people. It's amazing that they have thousands and thousands of acres of fruit orchards that they manage too. My only hope is that they make more!P.S. If you ever get your hands on the 25 case production of 2008 Syrah - I put the cork in every single one (with the exception of the last few). Glad to see you writing about Fielding Hills. We have been watching them closely and have written about them often since their 2005 Syrah received our highest Quality rating (5 stars out of 5) in a blind tasting in the summer of 2008. They are wonderful people, excellent growers, and talented winemakers. Cheers! Been buying Mike's wines for three years now and have had dealings with Karen by phone as a customer of theirs. Fielding Hills wines are amazing values for the money. It's nice to learn more about the people behind the label. They are really pleasant, dedicated folks. Great survey, Sean. Fielding Hills is a great Washington wine story (and exception wine too, of course). Tip of the hat to you and to Mike & Karen Wade. Mike and Karen Wade have been making gorgeous wines for many years now. I was happy to amongst the first few volunteer bottlers of the 2000 vintage (still have a bottle...without label). i love the wines. Plus, they are true to their roots. Congrats! 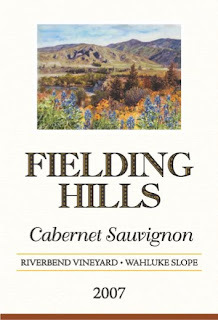 Love the write up on Fielding Hills. I really like to hear about how the winemaker's passion was ignited.